About once a year, I go to an event where I'm completely outshone by people who out-dress me and out-accessorize me. The event is usually a benefit, or a swank New Year's party. In the other words, it's an event where I don't quite belong. It's always awkward – part of my brain knows that it really isn't important whether the dress I'm wearing is two seasons old or whether my shoes are from Marshalls. In a way, frugality is a point of pride. But truthfully, there's always that urge to fit in and look like I can afford a certain lifestyle. This is where costume jewelry comes in. I recently blogged about Swarovski Crystal's fun and whimsical jewelry. They also make really elegant pieces that can pass for the real thing. 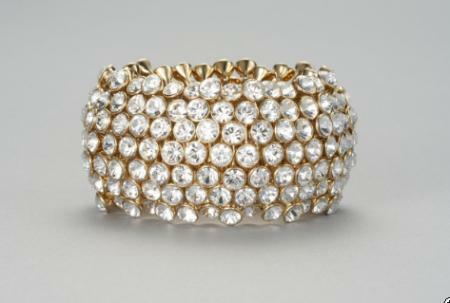 Ann Taylor is carrying a Swarovski Crystal Stretch Bracelet that would fool all but the most discerning eyes. It really looks like a vintage piece. So now I can don my cut glass and throw my shoulders back. Not only do I fit in with the crowd, I achieved "the look" for $135.00. Now that's satisfying. I completely agree. I hate spending more than needed on outfit and always plan on wearing what I buy many times. My trick is accessorizing from jewelry to scarves or even hats. I recently bought some inexpensive sterling silver jewelry including an amazing cuff from http://www.elvdecor.com , I wore them at a black tie dinner and received a lot of compliments on my look. I definitely agree. I think that costume and Fashion jewellery are very creative product. This product is very nice and looks like a vintage piece. Thanks for information. I definitely agree, frugality is a point of pride! I’d much rather look good without breaking the bank and it isn’t THAT difficult to do so. Its all about finding the right places.